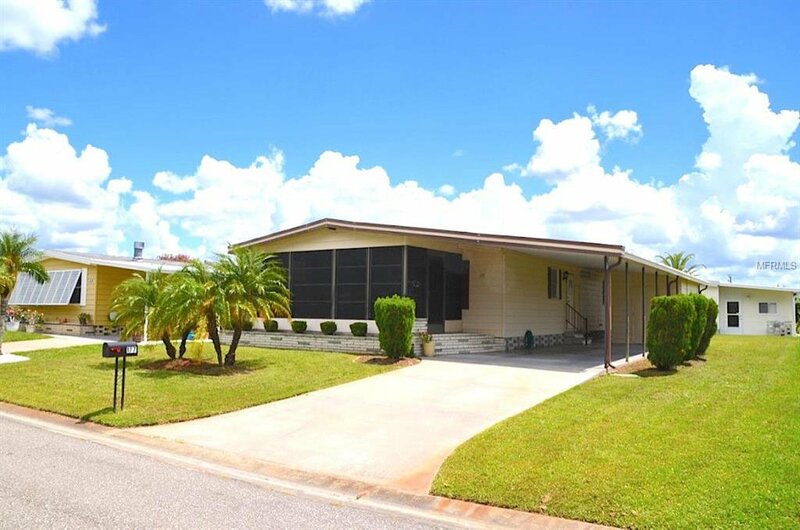 This sweet, well maintained 2 bedroom 2 bath home is located in one of best 55+ communities in the area. With low a monthly fee that includes cable TV, community pool, tennis courts, a fitness center, and a community boat ramp, this land owned home is a great choice whether you are a full or part time resident. The master bedroom is spacious with room enough for a full size bedroom suit. The master bath has a vanity area with two built in closets to store your linens or extra bath items plus cabinet space under the sink. Each of the 2 bedrooms has its own sizable walk in closet. The second bedroom can easily be used as a den or office giving the new owner of this great home freedom to choose! The large living room is area is adjacent to the kitchen and dining area and is a fantastic set up for entertaining. There is a workbench, full size washer/dryer, laundry sink, and shelving in the storage area under the carport. This property has a newer VAPOR BARRIER installed in 2016, the PIPES were changed out, the ROOF was double SEALED in 2018 and painted, and new kitchen and guest bath faucets were installed. Ask about home inspection credit details. This community is all about lifestyle and what a lifestyle it is to live in Harbor Isles! **The hall bath floor is being repaired as is the lock on the utility door. Listing courtesy of KELLER WILLIAMS REALTY SELECT. Selling Office: BISHOP WEST REAL ESTATE LLC.